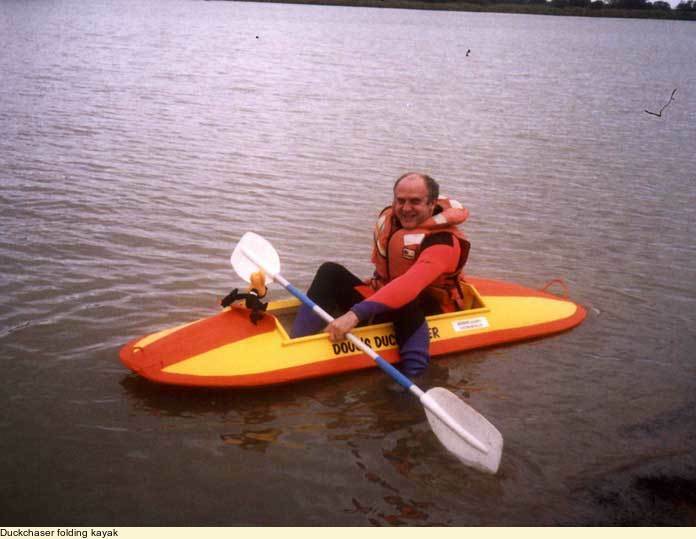 Duckchaser - brilliant reworking of an old folding kayak design. I think this little boat is just brilliant; I love it! The design goes back a long way, as you can see here, back to 1963. --> http://www.ida.net/users/tetonsl/kayak/ and the plans were expanded by the Scout troop that Don mentions on his site. 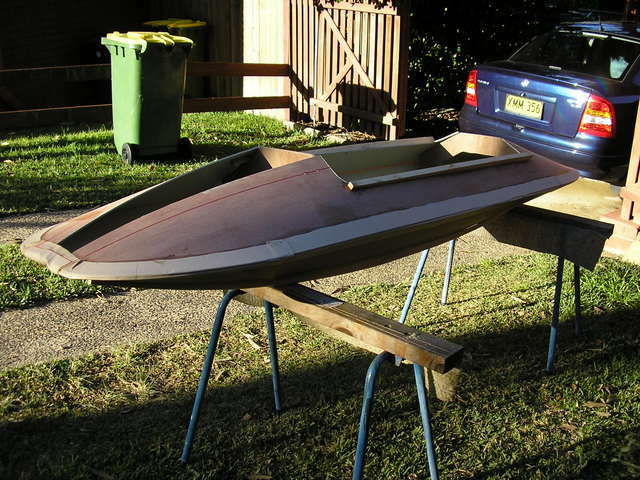 Don's contribution is to go for an 2.4m (8 foot) version, using very light 4mm ply, and more curvature, giving a very light and buoyant one man boat, and it sails too! 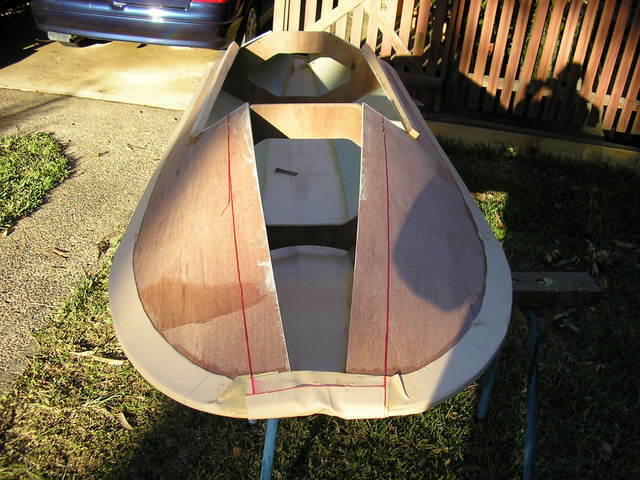 The original needed a 3m (10 foot) or 3.6m (12 foot) plywood sheet, pretty well unobtainable here in the land of Oz. 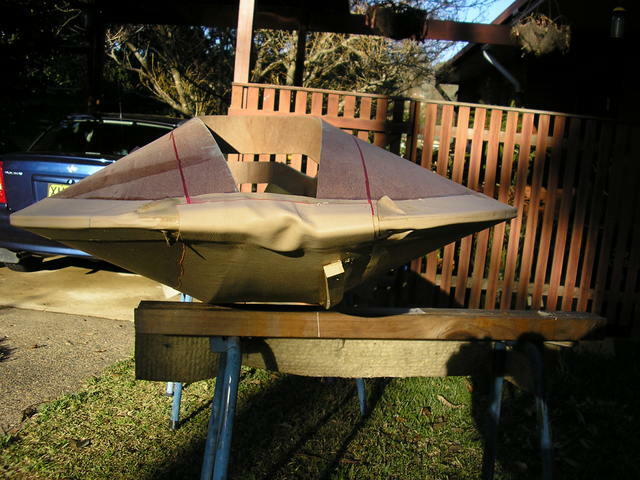 Pretty much according to Don's plans, but I am using some PVC upholstery fabric I picked up cheaply of EBay. Time will tell if it is robust enough. 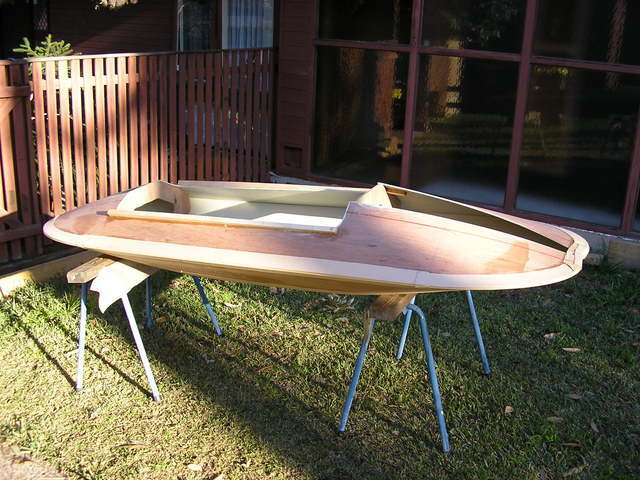 I used 4mm hardwood exterior ply, and Radiata pine for the runners, and find it very stiff. I can see what Don meant about cracking the ply. I haven't, but did crack one of the runners. I've glued it into one piece and will try again. BTW, gluing with contact cement is a messy business (at least when you are working alone) and getting the curves glued well is tricky.